Whether you need a physical or digital detox, Costa Rica has something to offer. Bordered on both sides by black sand beaches and landscaped with lush indigenous plants, the multi-terraced Four Seasons Costa Rica sits on the narrowest part of the Papagayo Peninsula in Guanacaste, the country’s most northern region. The hotel offers a variety of complimentary activities to guests and, at the time of my visit, the menu of options included a cooking class, a dance class, a sunset kayak tour and a guided nature tour of the golf course where howler monkeys and white-nosed coati romp. The luxury hotel’s new multi-day wellness program is available for five, seven or ten-day stays and includes offerings such as nutrition counselling, spa treatments, energizing activities like running, hiking and cycling customized for each guest’s level of fitness and evening sessions of meditation and relaxing yoga. 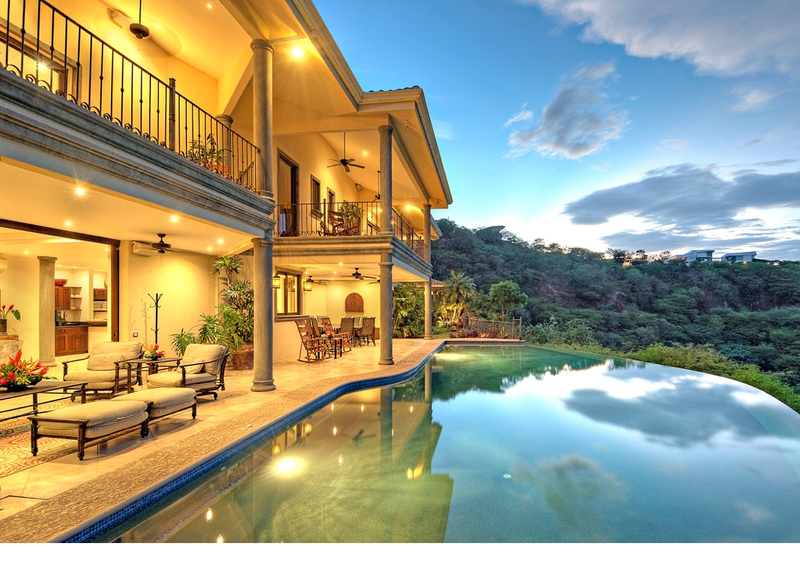 The infinity pool at Villa Estrella affords a serene vista of the Gulf of Papagayo against a ring of volcanic mountains, and sets the tone for this beautiful private home perched in the hills high above the village of Playa del Coco, Guanacaste. The all-inclusive two-story, seven bedroom villa, allows a group of up to 20 people to enjoy a five to seven-night customized wellness retreat. One of the main points of distinction at Villa Estrella is the ability to offer personalized meals. Hotel-trained chef Alberto Sandoval serves up beautifully prepared, nutritious and delicious servings using fresh local ingredients. Plus, he can accommodate a wide range of dietary requests from low-fat to gluten-free, vegetarian, and nut and seafood allergies. New this year, the chef is working with New York Times best-selling author Tosca Reno on dishes to serve guests who attend her Clean Living Experience retreats at Villa Estrella. Mornings find fit-minded guests participating in a stretch, yoga or pool aerobics class. And since the villa comes with its own air-conditioned 20-passenger van and driver, active day trips to places such as Rincón de la Vieja National Park with its cinder cone volcano and hot springs can easily be arranged. A 700-meter dirt trail lined with moss-covered rocks leads guests down to Rio Celeste Hideaway Hotel’s namesake river, Rio Celeste. As the river winds and gurgles its way through the Tenorio Volcano National Park, volcanic minerals turn the waters a distinctive turquoise. Located in a secluded rainforest setting adjacent to the park, Rio Celeste Hideaway Hotel is set up like a small village. A main building, plus a collection of nicely furnished and air-conditioned casitas are tucked into the lush foliage and strung together with a cobblestone path. Listening to the croak of Toucans and watching hummingbirds whiz by offers an in-the-moment connection with nature and, sometimes, guests are fortunate enough to spot a howler or white face monkey as they peer down through the canopy. Hotel amenities include an all-day restaurant, a bar area, a large sitting room with a fireplace, a pool area and wet bar. Because this region tends to be a cellular-free zone, it’s a good place for a digital detox, but for those who feel they must connect, complimentary Wi-Fi is available. Nearby highlights of this pristine rainforest region include the Celeste waterfall and the Tenorio Volcano. A collection of modern bungalows, raised on stilts in a forest setting just a short walk from the lobby, offers comforts such as air-conditioning, Wi-Fi and cable TV. And, at the heart of the property, the namesake Rio Perdido is fed by a hot spring that bubbles out of the ground at 43°C. Relaxing in thermal waters surrounded by nature is the ultimate in forest bathing. The eco-friendly resort offers about 27km of hiking trails and, for guests looking for more adventure wellness, there’s the Canyon Adventure including zip lines and a Via Ferrata (a climbing wall). Some guests make the Canyon Adventure an opportunity to step outside their comfort zone. As far as geographic regions of the world are concerned, Costa Rica is definitely well-positioned to become a verified wellness destination. This article originally appeared in OptiMYz 1002.